This is another recipe from my Alabaman grandmother, but modified for modern conveniences. I will reference the older fashioned way as well for those (like me) that prefer to cook from scratch as much as possible. This is more like a stew than a soup, which is the way my family likes it. Cook the chicken ahead of time, either use leftover chicken roast or cook the chicken breasts thouroughly with your spices of choice. Add the broth to a large cooking pot along with the cooked chicken pre-cut into bites, salt & pepper, and the stick of butter. Bring to a starting boil, but while this is heating up start prepping your dumplings. In a separate bowl add 2 cups of bisquick and mix in warm water until it is a pasty dough consistency. 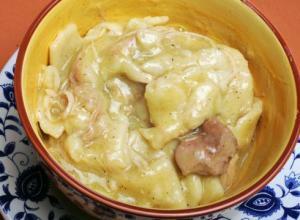 Start spooning in spoonfuls of the dough into the chicken and dumplings. Alternatively you can break up pre-made biscuits and start putting chunks into the broth to cook. Cook until the dough no longer looks doughy but instead looks like dumplings.